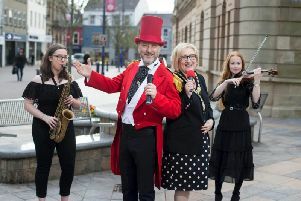 The festival, running from tomorrow to Sunday evening, brings award-winning American, Canadian and European bands to the picturesque west Tyrone parkland, with a crowd of 10,000 expected over the three days. Headliners include International Bluegrass Music Awards multiple nominees Darin and Brooke Aldridge, one of the hottest young acts in acoustic music in the US, as well as traditional veterans Mike Compton and Joe Newberry, and dynamic English band Old Baby Mackerel. Other big names in bluegrass music include the Demolition String Band; multi-talented duo Fellow Pynins, and five-piece Whiskey Deaf, from Portland, Oregon. The festival kicks off with the Allen Family Reunion, from Ontario, Canada. The Allens, with family links to Omagh, create a blend of fresh sounding yet traditional music. Belgian band Old Salt Collective, and English newcomers Midnight Skyracer, an all-female five-piece bluegrass band, whose youngest member is Tabitha Agnew, from Co Armagh, will also be crowd pleasers, as will Glastonbury veterans Two Time Polka. Local acts taking part include Co Down’s the Henry Family Band, a foursome at the forefront of the bluegrass and roots music scene across Ireland featuring the stellar voice of Janet Henry and the dobro flourishes of husband Colin, accompanied by their highly talented children James and Olivia. Co Armagh band Northern Exposure, a pillar of the Ulster bluegrass scene for 20 years, also joins the line-up. Visitors can also wander around the folk park’s exhibit buildings and bring their own fiddle or banjo for a jam session in the ‘Pickin’ Patch’ in the Pennsylvania Barn, or join Mike Compton and Joe Newberry in conversation at the Mellon Centre for migration studies to learn more about their musical lives. The festival, funded by Tourism NI and Fermanagh/Omagh District Council, concludes on Sunday with an atmospheric ‘Spirit of Bluegrass’ gospel concert featuring Darin and Brooke Aldridge in the unique setting of the 18th century Old Meeting House.